Whether you or a loved one are suffering from a high fever or minor sprain, our doctors at NorthWest Ohio Urgent Care in Maumee, OH are here to help you feel better fast. NorthWest Ohio Urgent Care is a walk-in clinic located at 1015 Conant St in Maumee, OH and is reachable at 1-419-333-8031. We offer children’s urgent care services as well and take walk-in appointments 7 days a week. 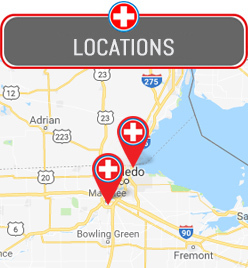 If you are looking for nearby urgent care services in your time of need, then look no further than our walk-in clinic! All of our physicians at NorthWest Ohio Urgent Care are board certified and have years of experience when it comes to providing family care and emergency medicine. We offer compassionate and confidential care, so that you can walk into our clinic assured that we will provide the best possible medical care. So the next time you are looking for an urgent care center in Maumee, come to NorthWest Ohio Urgent Care. We hope we can help you and your family feel better soon at NorthWest Ohio Urgent Care!